Since becoming a single Mom three years ago, my kids and I have traveled much of the East Coast. Those first few vacations alone with my children were stressful, but I’ve learned that a little planning and preparation can go along way. 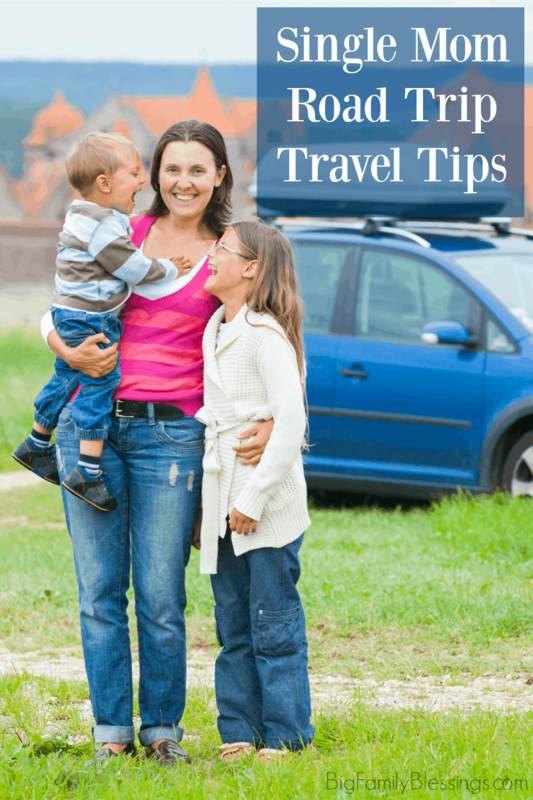 While I learned most of my single mom travel tips the hard way, you don’t have to! One of the biggest hardships while traveling as a single mom, that doesn’t get much easier, is being the only adult in the car while also driving long distances. By the time we get an hour or two down the road, my children are engrossed in their own activities while I’m beginning to get drowsy. It doesn’t matter how rested I am, the monotony of the drive and the motion of the car begin to make me sleepy. I’ve learned that like most issues that crop up with single mom travel, this problem can be helped with some planning and preparation. 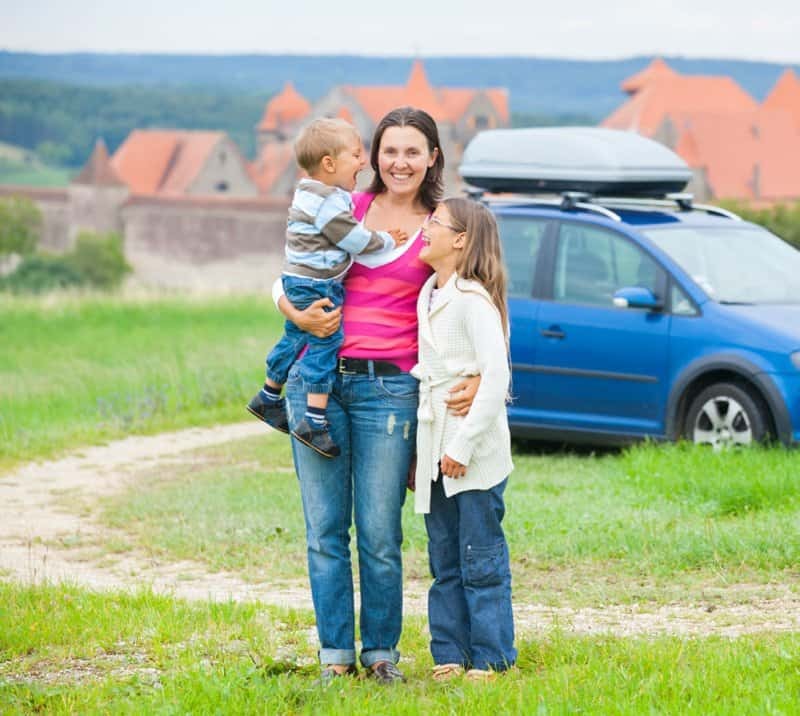 Let me share my best, “Stay awake and drive” single Mom travel tips. How to survive being the only adult in the car while driving long distances. Jam it out. My first method of waking up is cranking up the music. Before your trip create several upbeat playlists that will get you singing along and dancing in the driver’s seat. The longer your drive the more playlists you should make. Of course, make a playlist of your most current favorite sing along songs, but also think outside of the box. What is sure to get you moving? How about a playlist of old school songs from your youth. Not only will an old school playlist get you moving, it will get your brain going as you reminisce through the memories those songs bring up. Old enough to remember the songs from several decades? Make a playlist of upbeat songs from each decade. Nothing like a little NKOTB and Paula Abdul to get me singing along and remembering dancing in the living room with my cousins in hand-me-down leotards! Snack slowly. This is a trick my dad taught me from his days of traveling for work. Pack a snack you enjoy that comes in bit sized pieces (gummy bears, chex mix, etc). Look for mile markers on the highway and eat just one piece each time you see a marker. Not on the highway? Make a different challenge for yourself. One bite for every intersection, or corn field, or each time you see a license plate that isn’t from the state you are driving through. Keeping your mind active and having a treat to look forward to goes a long way to keep you alert. Get moving. Even in the driver’s seat you can move to keep the blood flowing. Stretch your arms, pat your leg, or whatever it takes to get that blood moving while still keeping your eyes on the road. Rely on mint and citrus. Mint and citrus can help you feel alert. Pack a bag of mint and citrus flavored things such as gum, hard candy, and breath mints that are easy to grab when you need a quick pick me up. Stop and stretch. Just a few minutes walking around can help wake you up for miles. Really get moving on your bathroom breaks, do a few jumping jacks. When you are really struggling simply pulling off the nearest exit and walking quickly around the car 5 times will help. Try essential oils. Grab a car diffuser or a piece of diffuser jewelry with your favorite energizing essential oils to help keep you awake. Take the scenic route. Highway driving doesn’t keep your mind alert. Consider mapping out a more scenic route for travel. Varied scenery will keep you interested while staying alert for street and traffic signs keeps your mind awake. Play a game. Make all the children in the car turn off electronics to play a game with you. Play things like 20 Questions or I Spy. Caffeinate. When all else fails get a boost through caffeine. Pack a cooler to keep beside the drivers seat with your favorite cola, or make a quick drive through stop for your favorite caffeinated drink. And repeat! Rotating through all these strategies should keep you awake enough for an all day road trip! 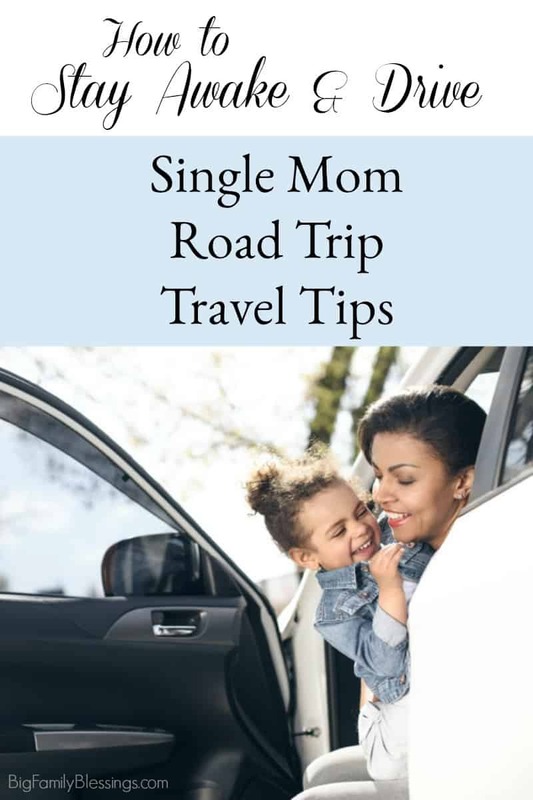 Be sure to check out my other single mom travel tips and get ready to have a wonderful time traveling with your children!